Francine and I happened to find River Rock Coffee when we stopped in St. Peter to visit the local Co-op back in October. We were hopeful that this coffee shop would have more than the standard (usually stale) coffee shop food. What we found was a sweet little restaurant and coffee shop that uses locally sourced food in artistic and intelligent ways. River Rock has a garden in nearby Kasota. They also source ingredients from local farms: East Henderson Farm and Living Land Farm. 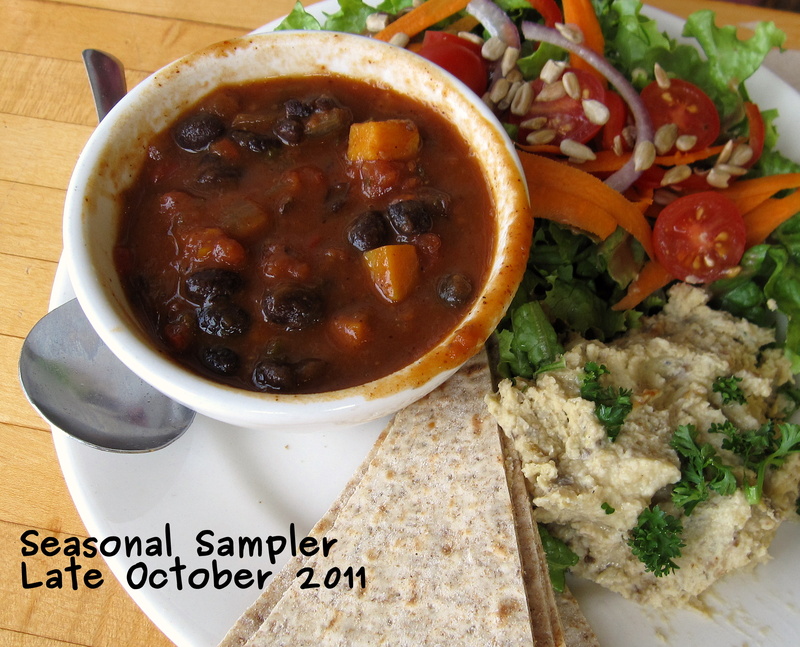 It’s evident that they consider what’s in season when preparing their weekly menu; the first time we visited we had Autumn Black Bean Chili. A few weeks later, on our second visit, we enjoyed a cup of Tomato Soup. Their weekly creations are posted on a “whimsy board” so that customers can gain inspiration about what to eat. River Rock also does an excellent job of maintaining their facebook page—keeping customers up to date on the delicious items cooking and baking in their kitchen. Since our first visit, we’ve returned a few times and each time we’ve found different but wonderful food (and of course, great fair trade coffee). We asked if the garden was close enough to visit. (I guess we’re becoming bolder and beginning to sound an awful lot like the characters from this episode of Portlandia.) We discovered that the garden is at the owner’s home in a nearby community. From our conversation, it sounded like this year they relied on their CSA shares more than the garden. Nothing wrong with this, it’s great to support other community growers and showcase the farmers’ hard work through creatively prepared dishes. The Autumn Black Bean Chili was delicious and beautiful. It was made with black beans, peppers, squash, and onions. I had it as part of the Seasonal Sampler with humus and flat bread. After shopping we stopped back in for coffee, and Francine found a new way to enjoy coffee—with honey and cardamom. She described it like this (on her facebook wall), “One sip and I’m taken back to making pulla (Finnish sweet rolls) with my au pair kids; another sip and I’m reminded of spicy Indian chai!” When food and drink transport you to a different time and place and leave you craving more, you know you’ve been cared for by the person who was inspired to create it. I am both a dreamer and a cynic when it comes to looking for a place to eat while traveling. I dream of finding a restaurant like River Rock, but I’ve been disappointed enough in the past to not expect much when stumbling upon a new place (usually I like to research places to eat before leaving home). The fact that River Rock’s food was wholesome and delicious and made with locally sourced ingredients gave me hope about discovering new restaurants while traveling. Also, I was encouraged to discover that our Southwestern MN restaurant neighbor is supporting locally grown food. The service was warm and inviting. The staff was knowledgeable and seemed to enjoy working there. These simple things made me feel comfortable and cozy. 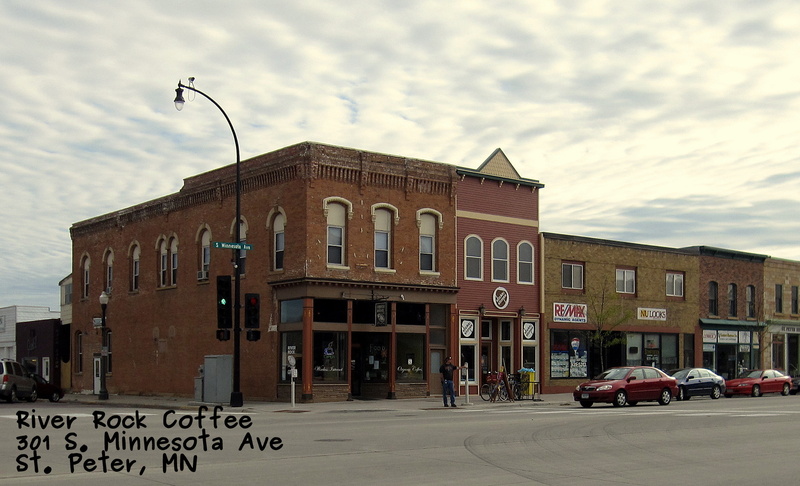 The decor was open and fun, but I would describe it as typical for a coffeehouse—a tad eclectic with a touch of grittiness. 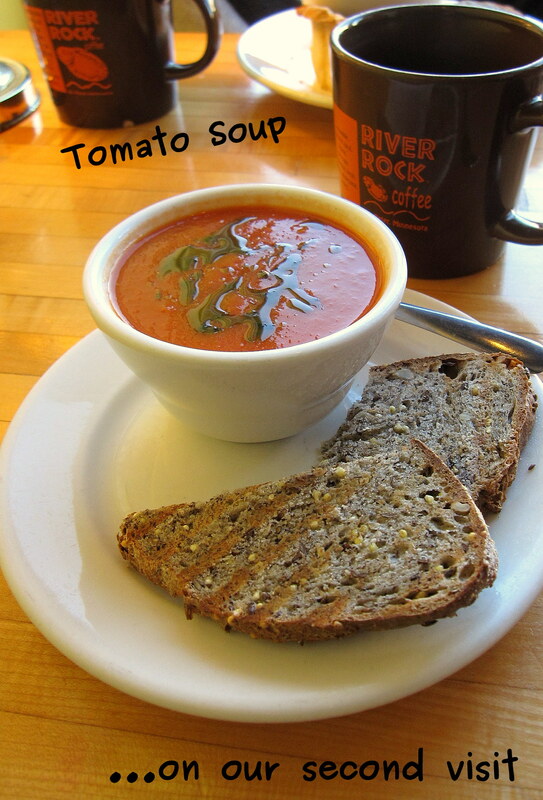 If you ever find yourself in St. Peter, MN and feel like a cup of fair trade coffee, a light lunch or fresh baked bread, stop by River Rock. They’ll treat you right and serve you some real local food. We know we’ll continue visiting and enjoying their inspired creations, and we look forward to keeping tabs on the good things River Rock Coffee is up to. I went there one night when they had a three course prix-fixe and live-comedy show. It was a blast! All the tables were full, it was warm and cozy, the service was great and the food was tasty. The main course was puff pastry stuffed with local sausage and kale, barely risotto and romanesco broccoli. Yum. If they do more events like these, you have to go! Thank you. You have given us cause to celebrate. That people appreciate what we have created at River Rock is reason to celebrate. We don’t advertise but we hope that one puff pastry, one muffin at a time, people will realize what we are trying to do. I remember two of your visits, and even though I was new, it was easy to talk to you about our menu, our food, our philosophy of buying local and seasonal. Thank you for appreciating that philosophy but even more, thank you for appreciating the wonderful flavors of the food because without that, none of it has meaning.